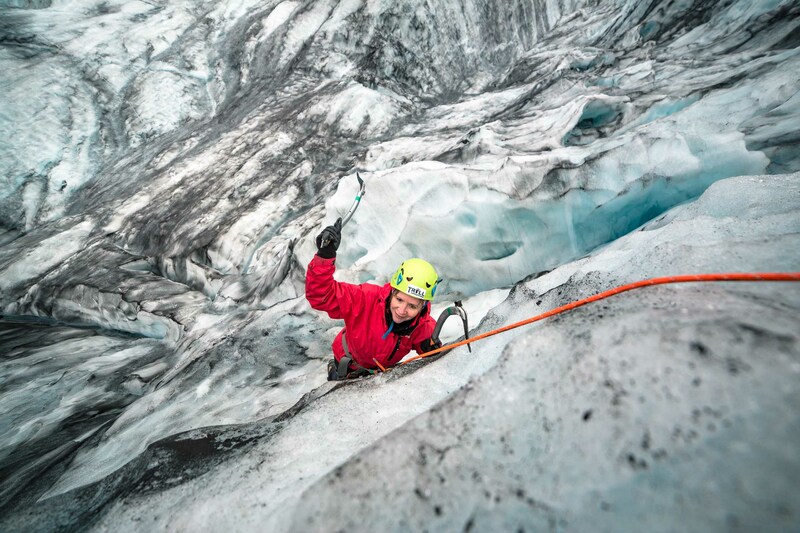 Experience the wild with this exhilarating expeditionary hike and ice climbing tour on an outlet glacier of Vatnajökull glacier, one of Skaftafell Nature Reserve's most intriguing wonders. At the car park by the Skaftafell Visitor Center, you will meet your certified glacier guide, who will quickly proceed to teach you the basics of glacier safety, the usage of crampons and ice climbing techniques. Your guide will be quick to distribute all of the necessary equipment for the journey, including crampons, helmets, harnesses, and ice axes. They will also be eager to teach you more details about both the National Park and the glacier itself, its geological makeup and centuries' old formation. When you're ready to begin the adventure, you will go to a glacier tongue, just one of the many glacier tongues that make up Vatnajökull, Europe's largest glacier. As soon as you step onto the ice cap, you will have an incredible perspective of the surrounding mountains, including the country's tallest peak, Hvannadalshnúkur, instantly recognisable to fans of HBO's Game of Thrones. The journey continues on foot, and you will soon be trekking through the majesty of a white blanketed wilderness; the silence is only broken by the sounds of your boots treading the snow and ice. You will be surrounded by fascinating natural phenomena, such as a glacier moulin—best described as a vertical canyon that cuts deep into the ice cap—and age-old ice sculptures, turned electric blue due to the ancient oxygen trapped inside. Throughout your hike, you will have the opportunity to try climbing with ice axes, adding an extreme edge to this largely picturesque tour. 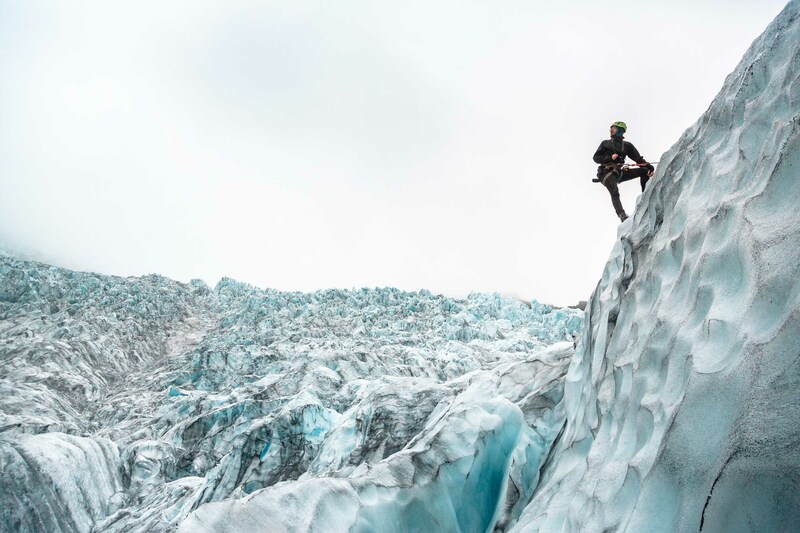 Hurry now and you too can experience the incredible thrill of scaling one of nature's most magnificent giants, the mighty glaciers. Check availability now by choosing a date. We will see you at our meeting point 30 minutes before departure time. Please note that if you arrive after departure time your place on the tour can't be guaranteed or refunded. Until April 30, 2019: The meeting point is by our marked trailer 150 meters South from Skaftafell Visitor Center. You can look up "Troll Expeditions Skaftafell" on Google Maps to find the exact location and driving directions. See a simple map below. From May 1st, 2019: The meeting point will be at Skaftafell Terminal Tour Center by the main road. You can look up "Skaftafell Terminal" on Google Maps to find the exact location and driving directions. Driving time to Skaftafell from Reykjavík is around 4 hours and 30 minutes. If you arrive early, you can visit Skaftafell Terminal Tour Center which offers free parking and has restrooms. 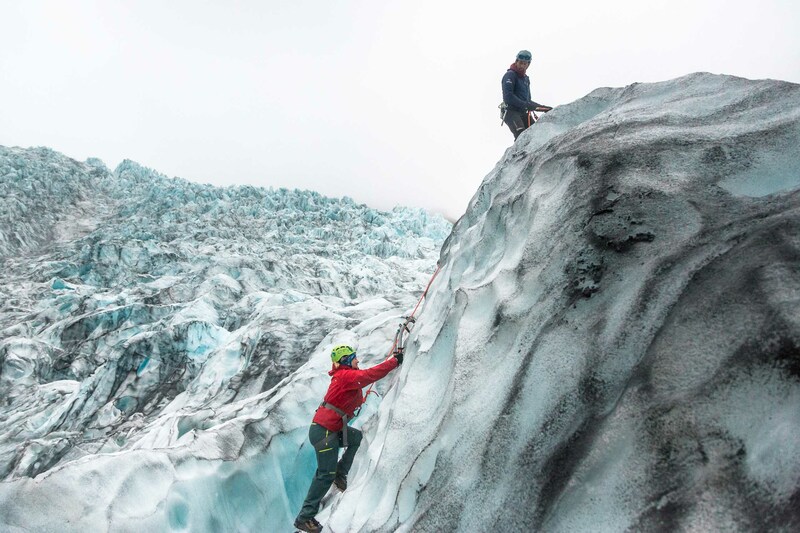 - This tour does not require any prior experience glacier hiking or ice climbing. - The difficulty of the Ice Climb is tailored to each individual. Your personal abilities and physical condition will be taken into account when the ice wall, which you will climb, is selected. Our guide was very nice and helpful. He had many iceland stories to tell and he taught us how to ice climb. The view of the glacier is great. And the ice climb was a once in a lifetime experience for us. We really enjoyed it!! The weather was perfect. It was windy that day and our tour was moved to the afternoon but it was the right choice since the weather when we did the trip was perfect. Very good service. We booked here during our 1st and 2nd trip to iceland and we’ll book again of we were lucky to have a 3rd trip here. Till next time!! It was an incredible experience. There were 12 persons in my tour but fortunately, every one was skillful and mastered the climbing technique easily which left time for a hike through a random route (always led and assessed by the guides) which made the tour more fun. The guides were very knowledgable and friendly. Steff in particular has a great vibe and is very friendly. I think this tour is much more worth than doing only the glacier hiking. This was my favorite activity in Iceland. I would highly recommend this tour. The tour guides were accommodating, informative, allowed us to take pictures, and made the tour really fun. This is a tour that is totally doable. So I would highly recommend it for those who are even scared or having second guesses, because it was a blast. 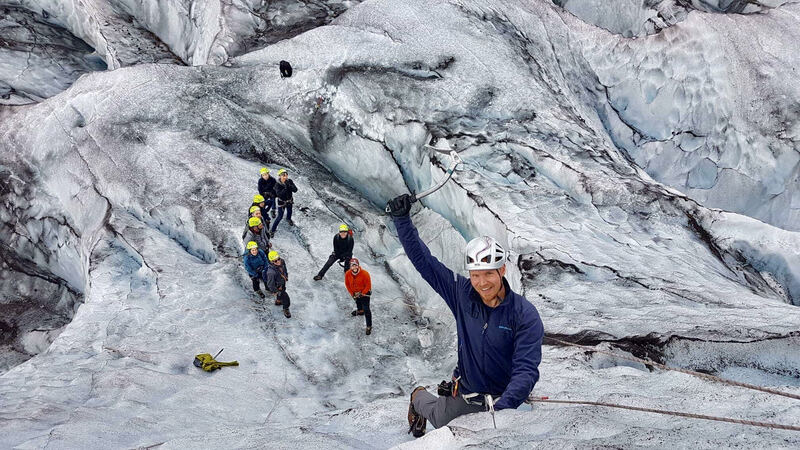 We did the four-hour “Skaftafell Ice Climbing and Glacier Hike Tour” with Troll Expedition on August 14, 2018. It was a wonderful experience! There were six people in our group coming from different parts of the world with one guide. Our guide Vincenzo was great! He was patient, knowledgeable, and helpful. He gave us the basic knowledge about glaciers and detailed instructions about how to put on the crampons, how to use ice axes, how to walk on the glacier, and how to climb up and down a glacier wall. The ice climbing was fun and is not that hard if you follow the instructions well. But it does take away a pretty long time from your tour, because the guide has to climb up the wall setting up the safety rope first and you have to wait for everyone climbing up and coming down the wall one at a time. Our group did one climbing and decided to spend rest of the time on glacier walk and sightseeing instead of a second climb. Our guide took us for a long walk on the glacier to an amazing moulin. He set up the safety rope and held us one by one to the edge of this deep moulin. The wall of the moulin from hundreds of years ago was pure electric blue, with the water running on the bottom. That was very pretty! He told us about the formation of moulins. It was way over four hours before we finished our tour. Thank you to our wonderful guide, Vincenzo, for the unforgettable experience! This was one of the best tours I did in Iceland. The Icelandic experience would not be complete without climbing the glacier. Our guide was very helpful and informative. We climbed two ice caps. It was really fun and exciting. It was quite a bit of exercise. The tour was about 4.5 hours in total. Amazing experience! Definitely the best adventure on our trip to Iceland. Big thank you to our guide! Despite some rainy and cold weather, the ice climbing tour with Michael and Oskar was the highlight of our trip. We really enjoyed the climbing, but the walk along the glacier top was also very informative and pretty. The guides really made the tour enjoyable. This was a really fun experience! Guides were very knowledgeable (and funny! ), and it was wonderful being able to get some ice climbing experience as more of a traditional rock climber. 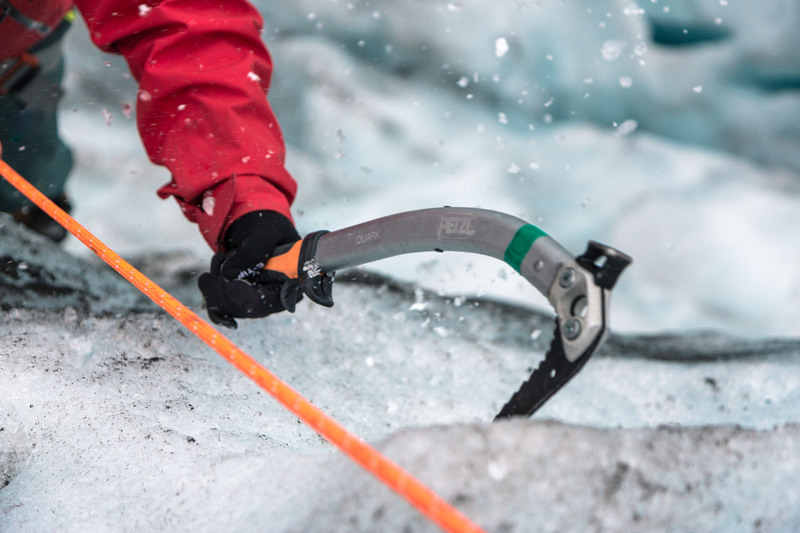 This tour really does cater for all experience levels; if you want to make your ice climbing experience more challenging, you start lower or on a longer rope, and if not you start higher up on a shorter rope. Well worth the money as a unique and enjoyable experience. 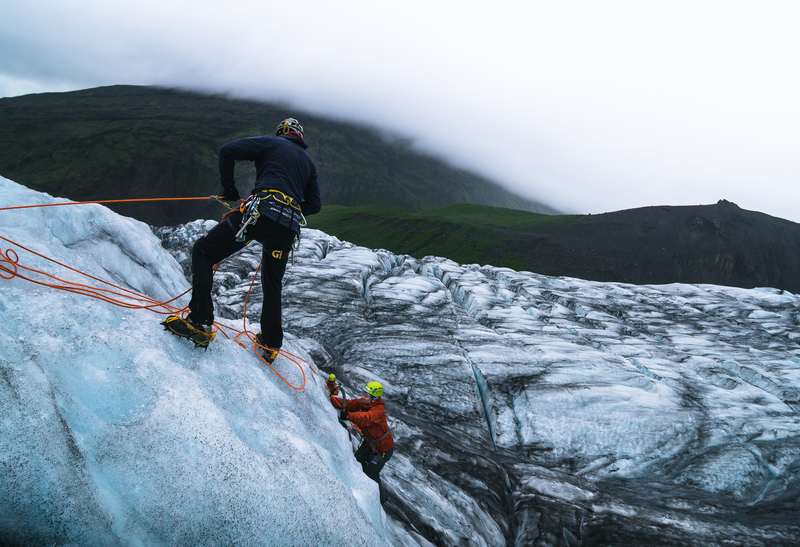 Our Ice climbing tour was the most anticipated stop for our Iceland trip, and it didn’t disappoint. Our guides were informative, funny and knowledgeable and the glacier was absolutely stunning. The ice climbing itself was a unique experience, being lowered into a canyon (only to your comfort level) to ice climb out is something none of us will ever forget. I would say however our group was a little bit too big, 11 people and 2 guides, which meant we had a lot of standing around waiting for our turn to climb, both on the practice and canyon climbs. I would recommend this tour to anyone that visits Iceland and would definitely do it again! Our favourite tour during our week in Iceland! Started with some ice climbing which was slightly challenging but loads of fun! We also had an amazing glacier walk afterwards. Our guide Vincenzo was very encouraging and helpful. Amaizing experience, more than worth the price! Decided on a whim to go book a glacier hike when I was in Skaftafell. 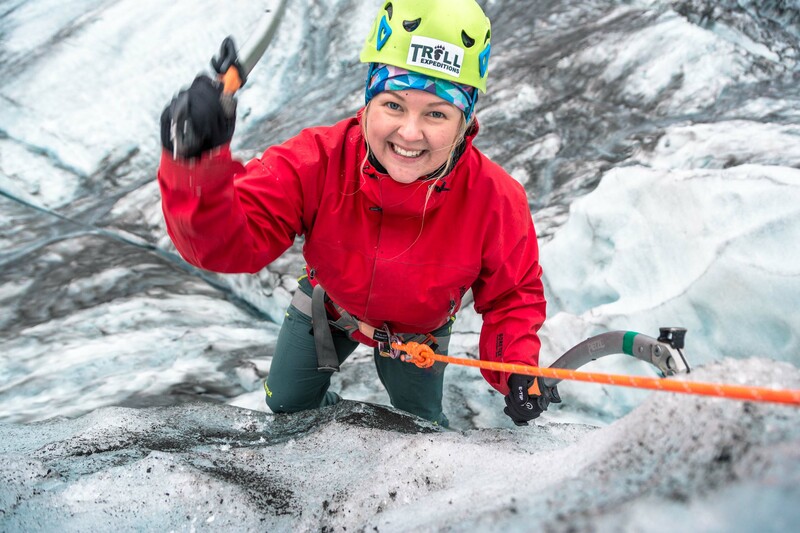 The guides at Troll Expeditions convinced me to book the Ice Climb and Glacier Hike tour and it was the best decision ever! This was definitely the most fun experience I had in Iceland. Our guide was Lydia, she was full of energy and really made the effort to bring the whole climbing group together. We had so much fun and climbed in two different places. Highly recommend! My husband and I absolutely loved this tour, and most of that was due to our guide, Vincenzo. He took extra care to make sure we were safe and also having an excellent time. Definitely the highlight of our Iceland trip! I did this tour towards the end of April. Our tour guide was really great at guiding us safely through the different parts of this activity. The tour guide was very friendly, patient and cared for everyone's safety in the group. Make sure to wear warm clothes according to the weather. And most importantly follow the guide's instructions as it is very important for everyone's safety and great experience. My sister and I had a blast with Gisli via Troll Expeditions at Skaftafell glacier. We only had 6 people in our group excluding our tour guide. Gisli was very personable, and allowed us to slow down and really enjoy each moment. He had no problem with us stopping to take photos, and even went out of his way to make sure we got really great pictures. He even made sure everyone had a time-lapse video of our ice climb. We were able to have 4 turns at ice climbing, one with one pick to make sure we were using our crampons properly, two with 2 ice picks including getting a sweet photo-op and time-lapse video, and one timed. He made it a fun contest to see who could climb the fastest, representing their country. We hiked for a short bit, taking in the views, and our tour guide had no problem with us asking questions, and he really took the time to turn them into conversations. Our tour guide gave us photos and videos of us via airdrop, and even added destinations into our googlemaps after learning that we planned on making stops along our way back to Reykjavic. Many of these stops we would not have known to look for.He gave us a great restaurant recommendation for dinner in Vik as well. Not just Gisli, but all staff we came into contact with went out of their way to be helpful and ensure we enjoyed our time. We had a great experience and would recommend others do this tour. My girlfriend and I visited Iceland for vacation and came across the "Skaftafell Ice Climbing & Glacier Hike Tour". We were a bit worried that this would be too intense or extreme for us, but we were pleasantly surprised. Our guide Juan was so knowledgeable, friendly, engaging and encouraging when it came to the glacier and the climbing. We hiked for a few hours across the glacier and came to a wall Juan thought was perfectly suited to climb. It was a bit nerve-wrecking at first, but so exhilarating once you get the hang of it. It was so much fun and nothing to be afraid of as anyone who is fit to hike can climb to the top. Definitely recommend! My husband & I visited Iceland on our honeymoon. 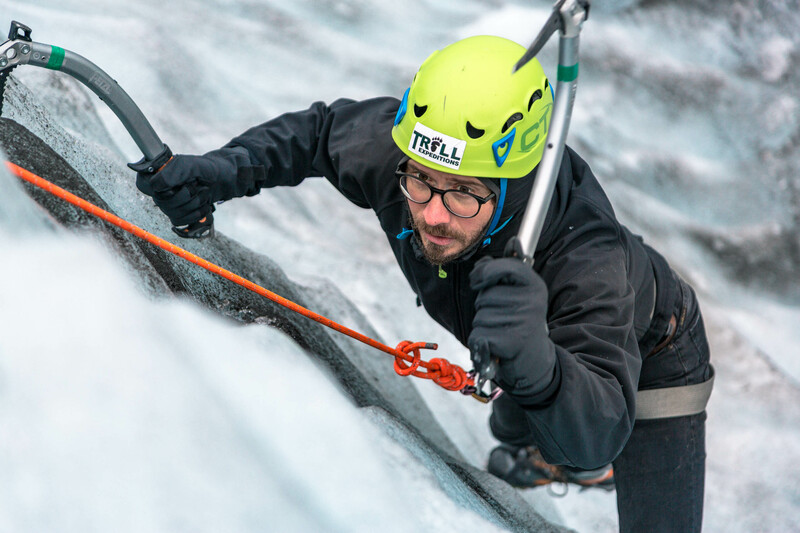 Tröll Expeditions' glacier hike & ice climbing experience was by far the highlight of our trip! Brynjar, our guide, was really awesome, funny and friendly. He was focused on safety and even gave us tips on how to take good photos of the northern lights. We had a group of only 4 people and climbed up two different ice walls - both incredible. The glacier hike consisted of us looking at crevices, the scenery and Brynjar even took us into 2 ice caves - one was almost fully melted and the other was still more-or-less there. Seeing a blue ice cave was not supposed to be included in our tour but Brynjar went the extra mile to make our tour amazing. An unforgettable experience in a beautiful country. Thank you Guide to Iceland for making the search & booking process so easy - you were very quick to answer my questions via email, which ultimately helped us make the decision to go with this tour. Thank Tröll Expeditions for the tour - I would easily do it again! Me and my boyfriend took a glacier hike and climbing with Joss, Ash a Primier (sorry if im spelling it wrong) The tour took 5 hours and although it was raining all the time and we got soaked we enjoyed every minute of it and will come back for more ice climbing for sure. Thank you guys! Had a great tour with Tim (don't know how to spell his Iceland name). Did some ice climbing, a little glacier hike, and tried to visit a small ice cave, which unfortunately was flooded during our visit, so we were only able to look inside the cave at the entrance. Overall, it was a beautiful experience! We had a great tour with Mike! It was only 4 of us, which was great (6 max for ice climbing). I am really glad that we chose to do ice climbing instead of just walking on the glacier (boring). Mike was cool to talk to and he answered all of our tons of questions. The climbing was really cool, although a little scary! I highly recommend this tour and Mike! We did the ice climb tour in October 2017. We had a GREAT time and and amazing experience. We loved our guides Sammi and Geiser and felt like we got a lot of personal attention. We were never bored and had a ton of fun. We did have 2 problems though, which were rather disappointing. 1. We were told the tour began at 12 and it didnt begin until 1. We based our whole day around this and it was really upsetting wasting an hour of our timing sitting around when we only had 4 days in Iceland. 2. We were told groups would be small- we had about 18 people in a group with 2 guides. It would have been nice if our group was a little smaller. All in all a great experience and totally recommend it. The ice climbing and gracier walking is interesting, the ice was so blue, the climbing needs a lot of strength, our tour guide is humorous which make the tour a lot of fun. The only drawback is the time is too short, we need a lot of preparation, so next time we want to book a longer gracier walk. We did the ice climb and glacier hike on Sept. 26, 2017. At first, I thought the staff were pretty unprofessional. They were late arriving to take us to the glacier because of a large group before us. They cursed in front of us, and seemed frustrated and annoyed and like they just wanted to be done for the day. However, this tour is so much less expensive than the others offered by other companies, that I do feel it was a great experience and good value for the money. The hike is something anyone can do, and if you have enough nerve you can do the ice climbing too. I do wish there was a little more climbing and even more exploring the glacier, but it was still one of our best experiences in Iceland. Definitely unique and something some people never get to do. And you'll get plenty of chances for photos. We had a wonderful tour! I loved that it was a small group (4 people in total, including us). We did the ice climb/hike on 24.09.17. The tour was just perfect. We all asked questions & they were answered appropriately. We all had plenty of opportunities to take photos and learn about the environment. Our group got to know a little bit about eachother, which was nice. It was just us and nature; that's all we needed! I would highly recommend. (And for those of you wanting to save a few extra ISK/USD/EUR, etc;, this is the tour to select as they are cheaper than other hime/ice climb groups Iceland offers. We had an amazing time learning to ice climb with Troll Expeditions and our guide Mike! The afternoon was definitely the highlight of our Iceland trip. Mike was a fantastic guide--although we had no experience ice climbing, he taught us everything we needed to know and showed us the ropes. He was also full of knowledge about the glacier and even taught us the Troll Expeditions yodel. This is a once-in-a-lifetime experience that we highly recommend if you are planning a visit! The tour group was 11 people (10 of which were my party, including myself). We started out at the meet-up area changing into climbing boots, putting on harnesses, and sizing crampons. We arrived at the glacier after a short drive. We hiked onto the ice, where our guides Helgi and Mike gave us basic instructions on how to walk in the crampons and proper ice climbing techniques. We went to two climbing areas: an easy slope since we were all beginners, and then more difficult vertical edge. Mike and Helgi were absolutely wonderful guides. They were friendly and energetic, and made us feel safe yet excited on the ice. We had a medical issue with a member of my party, and the guides were professional, caring, and very quick to act. Because this issue took a lot of time, they extended our tour so that we would all still get a chance to climb, for which I am very grateful!! I thank Mike and Helgi for being the wonderful people they are! The glacier was pretty dirty (covered in ash) and there were only a few spots we could see blue ice; however, I still thought it was a beautiful sight, worth 5 stars. The climbing was exhilarating and a real workout. Would love to do this again! Mike the American Troll was a fantastic guide for this tour. He taught us all the basic skills of Ice Climbing. We started with an easy climb just for everyone to know how to use the ice axes and crampons. Then we could start doing more climbing and more action. This was a perfect tour, and big thanks to Mike. Great tour, me and my wife were in a group with experienced climbers since we've done Ice Climbing before it was a perfect fit. Our guide was very experienced and clearly knew what he was doing. Climbing up those Ice Walls and going down in crevasses to climb back up was amazing. Could not recommend this tour more for everyone. It was the first time I've been Ice Climbing, and didn't have any special climbing experience. It was so much fun, getting to know how to use the ice axes and climb up the blue ice wall. Definitely some thing I will do again. Ice Climbing in the blue ice is amazing. A tour that everyone that loves outdoor activity must do in Iceland. They have good guides that take care of your safety while you can explore the wonderful blue ice in the glacier. This Ice Climbing tour is the one to do. We drove there from Reykjavík to visit Skaftafell and Jökulsárlón. On the way we saw this tour and decided to go for it. This was so much fun learning about the glacier the ropes and all the details of Ice Climbing was great. We had two guides the lovely couple Mike and Sigga. They were complete professionals and taught the group how to climb and use the axes. Great tour with great people. Fantastic experience, this Ice Climbing tour is one of the best things I've done. Mike was our guide, first he went over the rules and regulations. Then we went on to the glacier where he had found the perfect place to start our journey. Since I've never been Ice Climbing before he taught me the basics of the sport. Then I got the opportunity to try it and it was much easier than I would have thought. With Mike taking care of all the safety procedures I felt 100% safe. After the first climb, I was able to go a bit further and do more climbing and at the end of the tour I was getting good at this. This is the tour I would recommend to everyone. Great experience in great environment. I will never forget this experience, when our guide showed us how fast the glacier is melted, I was out of words. The hiking part is easy because there are special Ice shoes that fit the spikes that we use for climbing. When climbing the guide will teach you before trying the big wall climbing. Being from a country where there are glaciers I have to admit I have never seen an outlet glacier before and I have never climbed the ice before. I was a bit clumsy for the first round but after I got some training from Bjartur I was a lot more sure how to do it. Thank you to Guide To Iceland for the epic holidays. When I decided to visit Iceland, I had no idea that this was possible. Standing down in a crevasse with Ice axe in my hand trusting my life on a thin line (and in the hands of Johann Guide) I did not even feel cold as the adrenaline was to high. I made it miraculously out by climbing slowly up this perfectly blue wall. Our guide told us this was the best day of the summer and we felt privileged to be a part of this fun group on this day. This was one of the highlights of our trip! Troll Expeditions was wonderful and accommodating. One couple arrived about an hour late and so we had to jump on to the group doing the Glacier Hike only tour for a short period of time so that our guide could pick up the couple. It was great to see how flexible these Troll guides are and how well they work with each other. The Troll guides were personable and knew their stuff in terms of movie trivia, glacier facts, hiking and climbing. Once our guide came back, we continued our tours separately and our group began ice climbing. While climbing, our GoPro fell into the crevasse. Not a big deal since these things happen and the camera is replaceable. The other Troll guide showed up to try and save our GoPro (on his own) while our guide continued our glacier hike. The GoPro was not saved but I was thankful and surprised that they would go through the trouble of climbing down the crevasse on their own to try and save something that is replaceable. Apparently another group was trying to salvage another lost item (car keys!) at the same time. Stuff happens, just make sure you have good trip insurance! All in all, I was impressed by Troll Expeditions and would highly recommend this hike for everyone! When you drive towards Skaftafell you will pass all these majestic Glaciers, you can not miss this opportunity to climb with Tröll Expeditions. After 3 hours I was still hungry for more adventure. Thank you Tröll Expeditions. This nature is unbelievable! The ice is so blue and beautiful. Our guide was amazing and really kind. The glacier climb was incredible. I also learned some things about the glaciers in Iceland and how they are melting because of the global warming, that is so sad. You won't be disappointed with Trolls Expeditions so I highly recommend them! THANK YOU TROLLS! I am a HUGE Game of Thrones fan! :) So, to be able to see the North of the Wall was a great experience for me. If you like awesome (I mean AWESOME) landscape, this is the tour for you. Highly recommended. 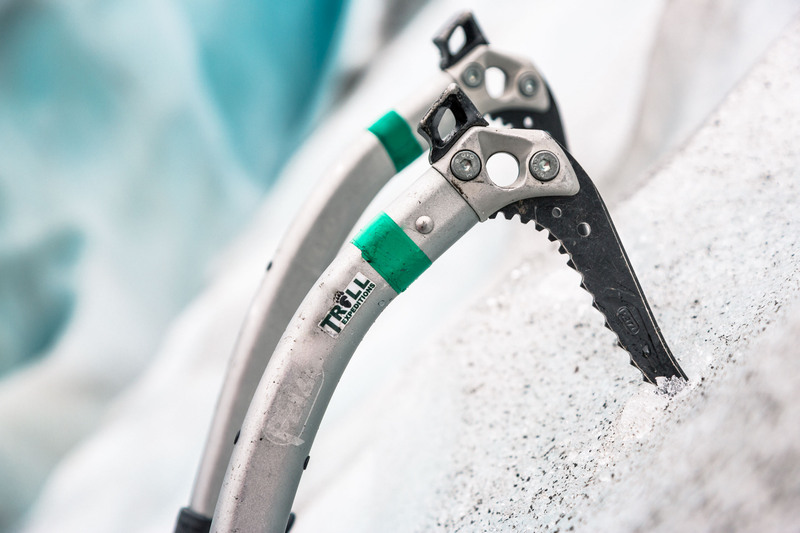 It took me a while do decide which tour Ice Climbing I wanted to go on and after check most of them I decided to go on a Ice Climbing with Troll Expedition. I am very happy with my choice. Skaftafell is just by Road 1 and it is easy to get by, if you have your own car (rent a car). I met the guide who taught us the basics of ice climbing. Both with ropes and all the safety gear. Even tough this is a more of an extreme tour I felt very safe the whole time and the guide clearly knew what he was doing, (feel bad about not remembering his name). I can easilly recommend this tour to all who are looking for a fantastic glacier experiance. I wanted to try something crazy, something that I would never imagine doing and decided to book this tour. This tour is spectacular in every way possible! I was really scared at first but the glacier guides were so friendly and understanding. They convinced me that I had nothing to be scared about. So I did the impossible...or in my mind the impossible and went Ice Climbing! It was such an adrenalin rush and such a thrill. I totally recommend this tour and if you haven't booked it you should do it NOW.